Flannel Friday is back! Yay! One of my New Year Resolutions is to be a more active Flannel Friday participant, so hopefully I’ll be able to meet that goal. (Although, and I warn you guys now, I’ll probably drop off of the face of the planet come Summer Reading.) Anyway, enough jibber jabber. Let’s get to my Flannel Friday contribution: Number Birds! We count a lot in my storytimes. And I mean a lot. So I thought it would be a good idea to see how good my storytime kids are at recognizing written numbers. My plan for this one is to have the kids help me count to ten, and I’ll point to each number as we say it. Then I’ll bring a number down to a bird and have the children tell me how many eggs to put in the nest. 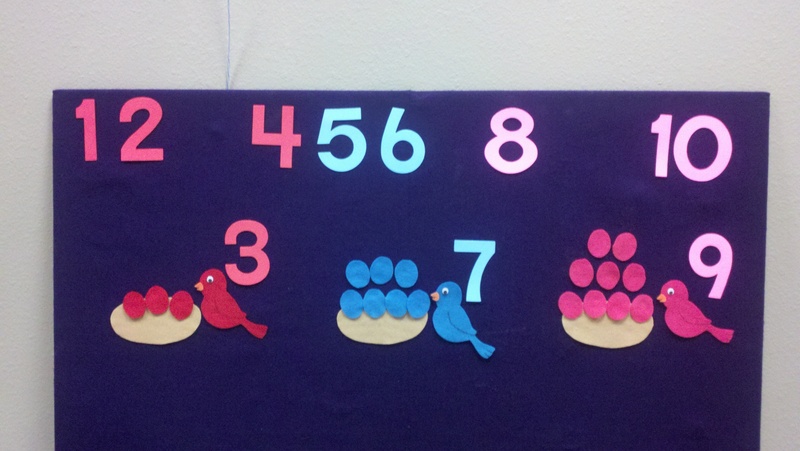 I also color coded the birds and eggs so that I can use these flannel pieces as a color and counting game as well. Being versatile is great for those days when the storytime crowd skews to the younger side. I loved your birds, and Your. Ideas for keeping it flexible!